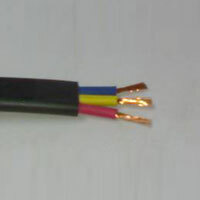 Located in Mumbai (Maharashtra), the company is engaged in manufacturing and supplying Flat Submersible Cables. The Flat Submersible Cables have rugged but flexible construction and are therefore suitable for submersible wiring requirements. We supply the Flat Submersible Cables in varied insulations and other specifications to cater to the diverse requirements of the clients.